Sarah Burt is my maternal 4th great grandmother and another one of my ancestors about whom I know very little. She was the daughter of John Burt and Susannah Silver and the mother of Sarah (Sallie) Rulon. I accidentally skipped writing about Sarah Burt in my 52 Ancestors in 52 Weeks posts even though I wrote about her mother and her daughter. I don't have birth or death dates for Sarah Burt. She married John Rulon on December 10, 1782, in Cumberland County, New Jersey. The children I have listed for them are John, Deborah, Lydia, Mary, Theodosa, Sarah (my 3rd great grandmother), Henry, and Anna. They may have stayed in Cumberland County for several years. 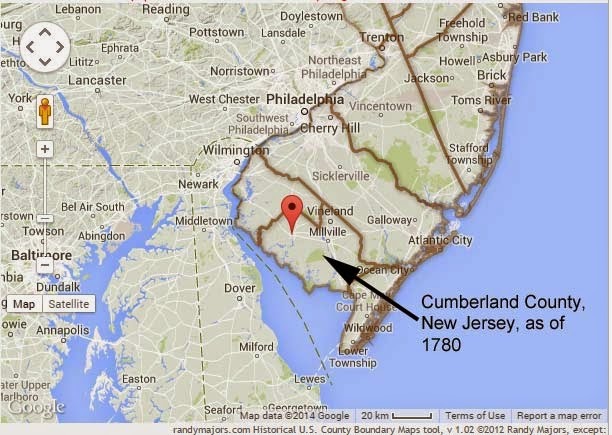 There is a John Rulon listed in the New Jersey compiled census records for the years 1802 and 1807 in Cumberland. Before I wrote this post, I searched online on ancestry.com and familysearch.org but didn't find any new information about Sarah Burt. I wish there were more hours in the day!